A business owner posted footage that purports to show the WC-130 Hercules crashing outside of Savannah, Georgia, on Wednesday. All nine people aboard were apparently killed in the crash. "Prayers go out to the families of all on board the plane that crashed in Garden City today," one netizen wrote on Twitter along with jarring footage of the wreck. 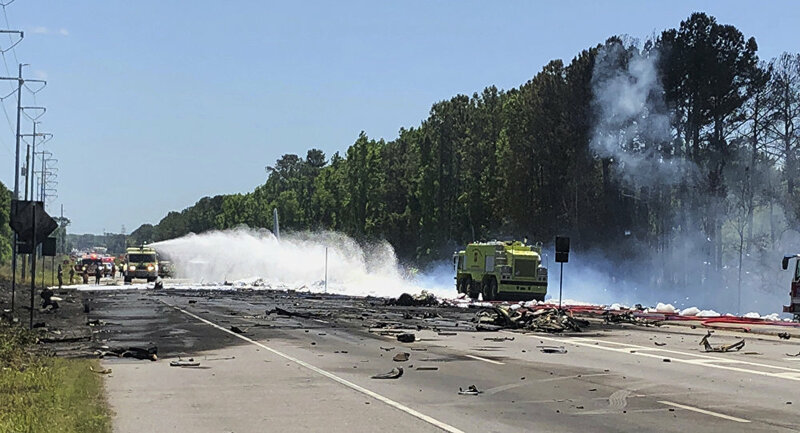 ​The cargo plane, later revealed to be 60 years old and on its last fligh to retirement, crashed for reasons that remain unknown, a spokesman for the Georgia Air National Guard said Wednesday. Initially, five people were reported as killed in the accident, with later reports identifying them as members of Puerto Rico's National Guard. It was revealed hours later by a local official that none of the nine people aboard the plane survived. ​The plane collided with terra firma around 11:30 a.m. local time close to the Savannah/Hilton Head International Airport. WC-130 planes are used by the US Air Force to conduct weather reconnaissance missions.